Courtesy photo Among the students at Claysburg-Kimmel Elementary who participated in “Toboggan Day” to raise money and awareness for St. Jude’s Children’s Hospital are (from left): Aaron Godfrey, Kylie Lewis, Haley Yoder, Alyssa Thompson and Savannah Gortney. CLAYSBURG — Claysburg-Kimmel Elementary School held “Toboggan Day” for St. Jude’s Children’s Hospital in the fall. 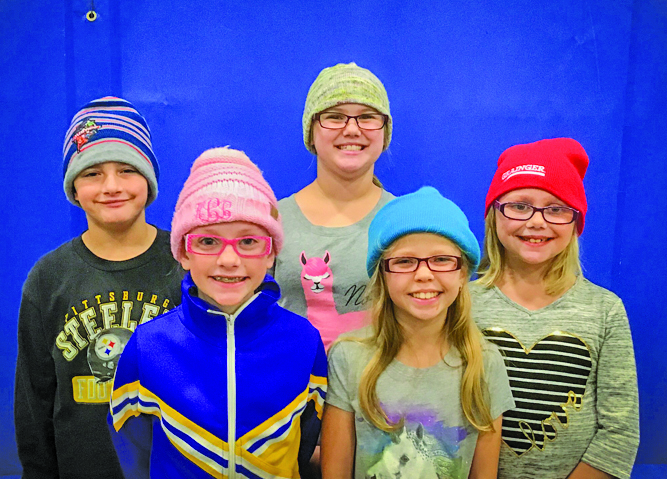 The students wore knit hats to show their support for children who have experienced hair loss resulting from treatment for cancer or other devastating illnesses. Claysburg-Kimmel Elementary partnered with Chili’s Restaurant in Altoona to help this national chain meet its goal of $5,000,000 to support St. Jude Children’s Research Hospital, to ensure no family ever receives a bill from St. Jude for treatment, travel, housing or food. The students at CKE began the week by taking coins to contribute to the cause. The students were in a homeroom competition to see which could bring in the most money. In addition, Chili’s offered a lunch reward for the homeroom that accumulated the most money for St. Jude’s. Each morning the coins were collected and counted. At the end of the day, the top three homerooms’ totals were announced. By the end of the week, the students pulled together 43 rolls of quarters, 63 rolls of dimes, 61 rolls of nickels, 488 rolls of pennies and various paper bills for a total of $1870.64 from their coin drive. The faculty and staff added an additional $182 from a Dress Down Day, for a total contribution of $2052.64 toward Chili’s national goal for St. Jude’s Children’s Research Hospital.